We’ve all been watching with wonder and amazement the performances and emotional achievements of the worlds best winter athletes at The Sochi Olympics. Whilst also hearing the back story of this being the $51 billion Olympics, where not everything was ready on time, and the tap water is also a gold, silver and bronze colour! Sochi, and the resort of Krasnaya Polyana where many of the events are staged, was a small, rustic Russian village and ski hill up until the start of the games. I saw this first hand when I went there to heliski four years ago. In January 2010, I had the rare opportunity to visit Russia in the middle of winter. Sochi had just been awarded the Olympics, and I had been in contact with a French company who had pioneered heli skiing in that region of Russia. Sochi, I would learn was the gateway to some amazing heli skiing in the Krasna Polyana area, but also Abkhazia in Georgia, just a few hours drive away. I had to go check this out, the venue for the next Winter Olympics, and Russia’s mountain range in a resort called Krasnaya Polyana (KP for short) made famous by President Putin’s impromptu ski trips where he’d have ordered snow making by cloud seeding, a few days before his helicopter arrival. The locals told me, it was common knowledge that if you heard the President was going skiing that weekend, then it would be fresh snow! What I discovered was a beautiful mountain range and valley, over pinning a really rustic, small ski village by anyone’s standards. An American Banker took me under his wing, and took me out my first night in KP for an authentic night out drinking local vodka, the local way – straight shot with a ‘chaser’ apple juice after, singing Russian songs with the locals (mountain folk as mountain-loving and hardy as you’d find in Chamonix or anywhere). As the fun of my first night unfolded, how this quaint, little out of the way place was going to host the next Olympics seemed beyond comprehension. Demountable restrooms back then, seriously! To put this into perspective, there was just one bar in town, maybe 2 restaurants, a few opulent Russian all inclusive hotels (for the post communism nouveau riche in Russia). 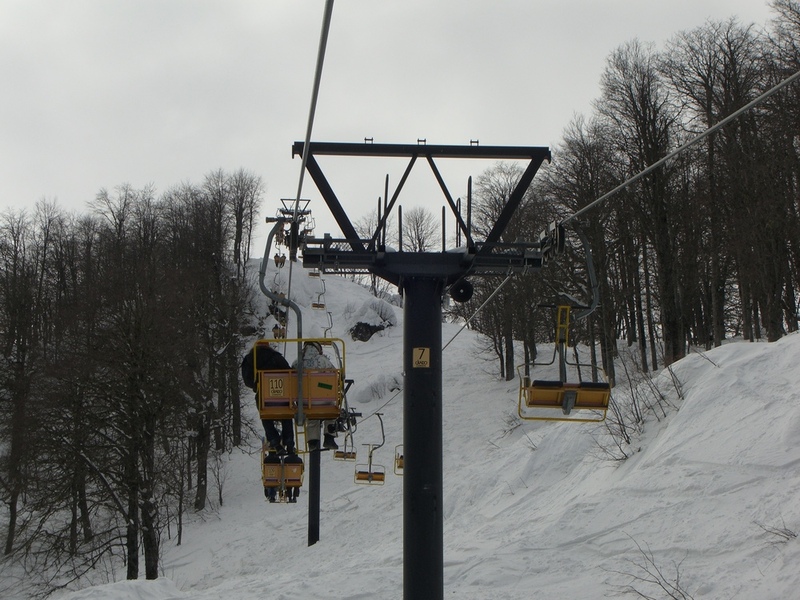 There were a couple of rickety old Russian double chairlifts, oddly engineered ski runs, with small funneled areas opening on to wide ones (read- in a crowd, it would be dangerous to ski there). And, to top it off, at the bottom, was a large, gravel carpark, with nothing but a few demountable restrooms, yes demountables! However, even by that time- January 2010, The Olympics had started to take shape in terms of a construction frenzy everywhere you looked. Looking down from the rickety chairlift all one could see was Lego-sized trucks, and cranes all over the place. I met several foreign engineers and workers from Canada, Europe etc who had been contracted at handsome rates to build the Olympics here, ‘in record time’ was the brief from the Olympic organisers. And even in Jan 2010, the first parts had been completed. They had just opened one new modern French ski lift, which was having teething problems, causing epic ski lines I discovered first hand. It just seemed bizarre, the old juxtaposed against the new. At the time, I didn’t know it was going to be the most expensive Olympics. I mean, how does Russia a country where the majority of their population live below western standards have $51B to spend on such an event? It was mindboggling. And left the question in my head, what legacy would it leave for this region and it’s people. Pride and amazing memories for sure, but what else? Well, ironically, even though I had travelled from Moscow to Heliski these great mountains, the Olympics construction frenzy had also managed to commandeer ALL of the helicopters in the region for construction. The weather was iffy anyhow, but there turned out to be simply no way we could obtain one, despite the Heliski operators booking it! Oh, well, never one to miss an opportunity, I managed to ski some great powder with our Heliski Guide Dimitry in the resort of KP. We had received about 30cms (12 inches) of fresh heavy powder, (up high, rain down at valley level), and this meant some fun in the trees and on the hill. Notably, most Russians are fair weather skiers, meaning the few restaurants were crowded to beyond capacity, whilst we skiers had the hill to ourselves. I was in a group of French guys, who had come to warm up heli skiing in Sochi, before moving on to Heliski in Abkhazia, Georgia. Given that they were heli skiing the next week, they decided against skiing with Dmitry and I, leaving us to have a wonderful fast powder ski afternoon. Instead, as the French do, they retired to the restaurant for a three course meal with wine. And as the French do, they complained profusely about the low quality of the food, and the service- not like the French resorts they said. Well, I had to agree, the food wasn’t great, but the experience was authentic that’s for sure, and the powder did not disappoint me. Now, I wonder how the fickle-by-reputation International Olympic Committee (IOC) managed to survive these conditions? Anyone’s guess I suppose.